4 Time Professional World Champion and Canada’s Legendary Muay Thai Pioneer Ajarn Mike Miles presents Calgary’s most exciting Muay Thai event featuring international athletes! Canada’s Hakeem Dawodu (Mike Miles MuayThai) continues on his Road to Glory after winning in Japan in November 2013. For January 24th, 2014 his opponent Junpei Hirai (TSK Japan) is an up and coming Japanese athlete who watched Dawodu fight in Japan and predicts the win, as he believes that he can nullify the Canadian’s strong points. If Hirai wins, he will go back to Japan with a huge name and lots of new opportunity to become a superstar in his own land. If Dawodu wins, it will be a big step forward towards fighting in Japan against some very well known athletes from Thailand and Japan. This will be a war as so much is at stake for both athletes. 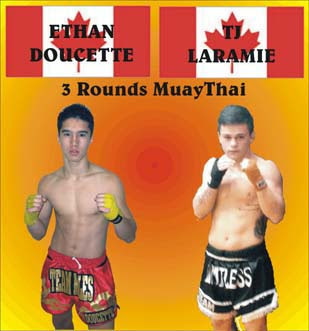 Calgary’s Ethan Doucette (Mike Miles MuayThai) squares off against upcoming star T.J. Laramie (Team Maximum). Laramie is the ultimate technician, having aced his way to winning the 2014 IKF World Classic Title. Doucette fought in the same event in a different weight division and lost a split decision that was very controversial. Regardless, Doucette steps up a few divisions for this exciting match-up between the up and coming stars of tomorrow. Support the future of Muay Thai. 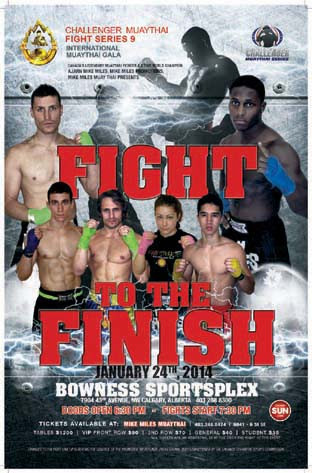 This entry was posted in Events and tagged Ajarn Mike Miles, Canada, featured, Muay Thai. Bookmark the permalink.